Now playing on Broadway: Riverdance, Saturday Night Fever, and Swing. Gershwin Theatre, 222 W. 51st St. Between Broadway and 8th Ave. (212-307-4100), $25-$80. Tue-Sat, 8 PM; Wed, Sat 2 PM; Sun 3 PM; 2 Hours 35 min. One Intermission. 80 members of Traditional Irish dancing, singing and music with the voice of Liam Neeson. Minskoff Theatre, 200 W. 45th Between Braodway and 8th Ave. (212-307-4100). Tue-Sat 8 PM; Wed, Sat 2 PM; Sun 3 PM. $30-$80. One Intermission; John Badham's disco. Sean Palmer as Tony Manero, and Paige Price as his dance partner. Directed and choreographed by Arlene Phillips. 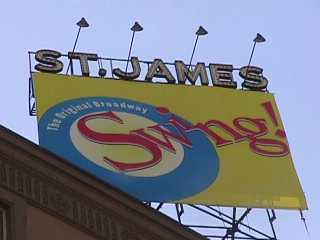 St. James Theatre, 246 W. 44h St. between Broadway and 8th Ave. 212-239-6200. $20 - $75, Tue - Sat 8 PM; Sat & Sun 2 PM; Sun 7 PM. 2 Hours. One Intermission. Lynne Taylor Corbett directs & choreographs as Jerry Zaks supervises the world class swing dancers and vocalist Ann Hampton Callaway as they rock the St. James. With Laura Benanti. 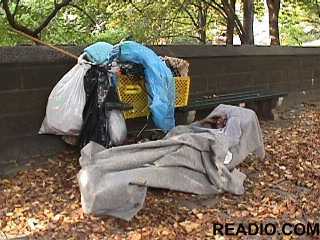 Click the National Coalition for the Homeless Call 202-737-6444, Or write, 1012 14th St. NW, Suite 600, Washington DC. 20005-3406.
International Hotel and Travel discount reservations through Readio are available. Click here!